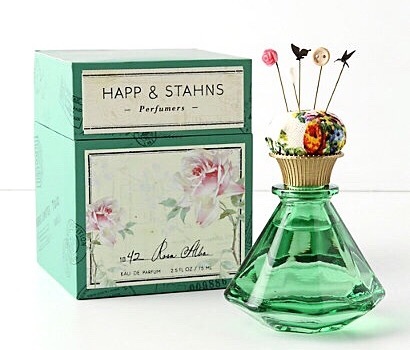 Today I wanted to share one of my favorite perfumes with you – 1842 Rosa Alba by Happ & Stahns. I am not adventurous when it comes to perfumes at all. I regularly use maybe 3 or 4 (that have been my favorites for years) and I rarely get anything new, despite the fact that I read about perfumes and fold the corners of a magazine to maybe someday try a new one haha! But his one here captured my heart instantly the second I smelled it at a local Anthropologie store. Its main notes are pink pepper, Darjeeling tea, grapefruit, wisteria, Alba roses, cashmere musk and amber wood. My favorite perfumes are those that are very woody or include fig extracts, and this one definitely ticks one of the boxes for me, despite the fact that its main notes are all very fresh and flowery. Not to mention that the bottle and the box are the most beautiful and whimsical things ever, wouldn’t you agree? "Red bow pumps & jean jacket"